Yeah, it’s not the most appetizing adornment. 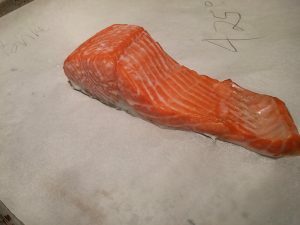 Hard to miss against salmon’s rosy-orange flesh, the white gooey stuff that sometimes appears during cooking is certainly a visual distraction. And might leave you feeling like you’ve messed up somehow. Possibly ruined that glorious piece of salmon even. First off, not ruined. Maybe a bit overcooked (more on that shortly), but not a calamity. 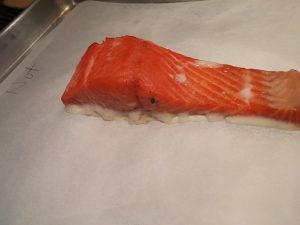 And you’ll be happy to know there are a couple simple things you can do when cooking salmon to minimize the phenomenon. The white stuff you see is called albumin, a type of protein that’s found in the flesh of salmon and other fish, not to mention other foods. (The white of an egg is called albumen, which contains some albumin among other components and makes things a little confusing, but there you have it.) Because of salmon’s distinct orange tinge, the albumin contrast is more striking so it tends to get more attention with this ingredient. Brined briefly and cooked at 425F, still some evidence of that albumin appearing on the surface. Here is what’s happening: during the cooking process, as the temperature of the fish increases the flesh begins to contract. The more it contracts, the more moisture is squeezed out, and that escaping liquid carries albumin with it. In contact with heat, the albumin sets, turns white and voilà: the white goo. It may be aesthetically off-putting, but it’s perfectly harmless…in fact it’s a healthy protein element of the fish. Because albumin hitches a ride with moisture extracted from the flesh, avoiding its effect has a double benefit: you avoid dreaded dry fish at the same time. Leave it to the culinary brains behind America’s Test Kitchen to have delved into this conundrum of limiting that unwanted white garnish. They’re proponents of a brief brine to help alleviate the appearance of albumin on salmon. Brining has become a favorite trick in our tool kits to keep everything from pork chops to turkey moist. Applying that to salmon (for as little as 10 minutes, as ATK states), you preserve moisture and limit that escape hatch for the albumin. This piece not brined but instead cooked at 225F for longer, you see much less albumin on the surface of the fish. overdose of heat or cooking time will squeeze a maximum of moisture out of the fish and you’ll have an abundance of albumin on the surface. Turning the temp down has a big impact. Instead of 8 to 10 minutes at 450 degrees, try slow-roasting the fish at 225 degrees for 20 to 25 minutes (depending on the thickness of the fish). There’s sure to be still a bit of albumin that shows up, but it’ll be minimized. There’s not much you can do to completely nix the appearance of albumin on salmon, aside from not cooking it at all. Even gentle methods such as sous vide aren’t immune, though with the double-dose of a quick brining and low temperature cooking you’ll go far to diminish it. If you find the hard-to-completely-avoid albumin to be a pesky annoyance, you can certainly scrape it gently from the fish with a table knife before serving. Or consider creating a delicious visual diversion with a sprinkling of fresh herbs, toasted breadcrumbs, or a light, flavorful cherry tomato salad. At the core will still be a delicious piece of salmon that’s less challenging to get right than you might think.